Massive Tap Root ripped from the Cap Rock, some of the rock came with it! Smooth surface broken, reveals shells and coral make up the cap rock surface. Hurricane Wilma became a record storm while down below Cuba and dealt Mexico a severe blow. The lowest recorded barometric pressure recorded for a hurricane. If you don't know, the lower the barometric pressure, the stronger the winds the hurricane has. Wilma became a category 5 hurricane, the maximum category. Fortunately for Florida, the strength of Wilma reduced before paying Florida a visit. Even then it was a category 3 hurricane when it came ashore on the lower west coast of Florida. 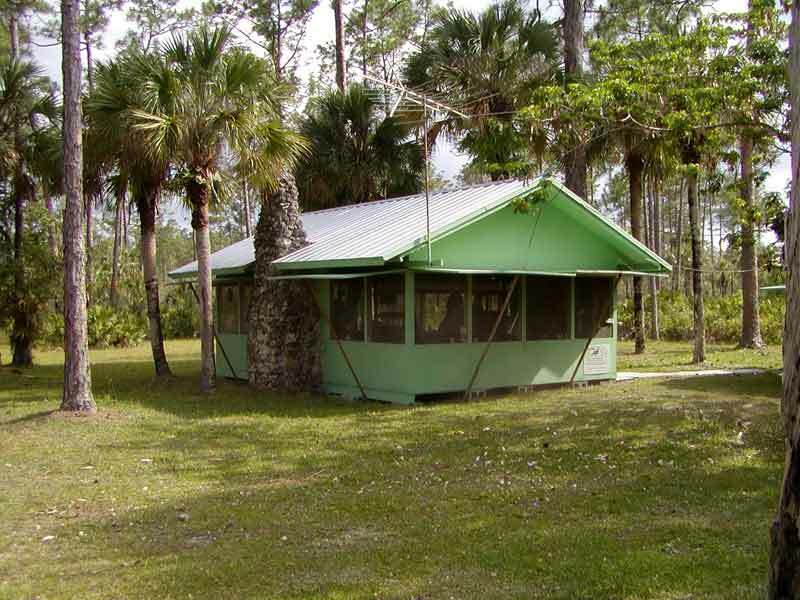 Its path brought it directly over the Big Cypress Swamp. While the forecasters were predicting it would greatly reduce in power as it went over land, They were wrong. They seem to ignore the fact that the Big Cypress Swamp and the Everglades were covered with warm water during this time of the year. Where the storm would normally be starved for warm water over land, its path was right over warm water. Consequently the storms strength did not decrease as much as expected. Oh! there are other theories, about a cold front following it on the back side of the storm, the eye being so big that it didn't lose momentum, that the big eye of the storm fed from the Gulf Stream after it partially left land, but I prefer my theory. They will spend years speculating about why it held its strength. 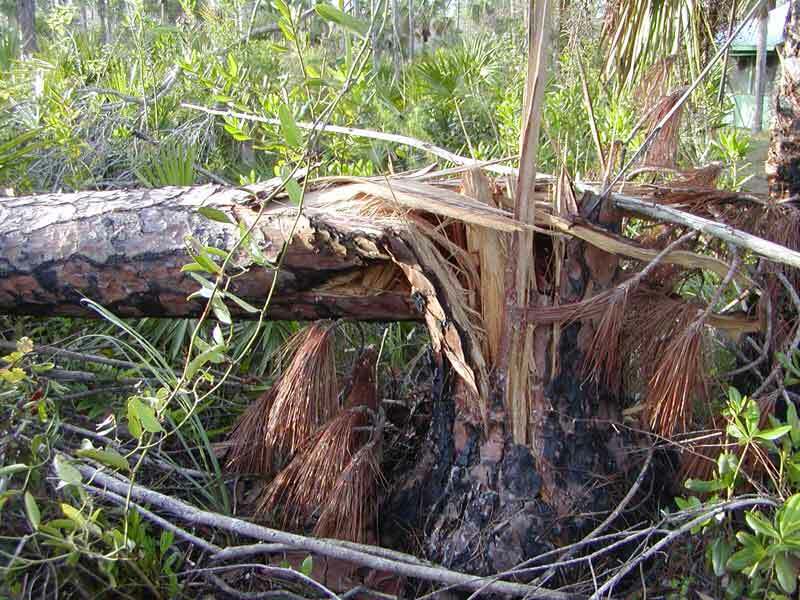 Fortunately for the Big Cypress Swamp, nature is very tough. 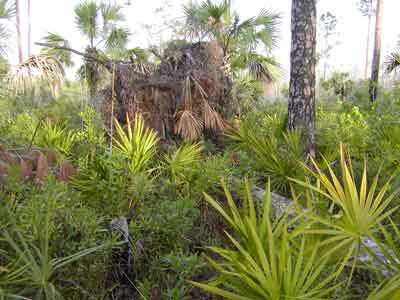 Where most man made objects in the Big Cypress Swamp suffered damage from Wilma, most of the natural things suffered little damage. I would estimate that one out of twenty pine trees suffered damage, such as up rooting or snapping off. 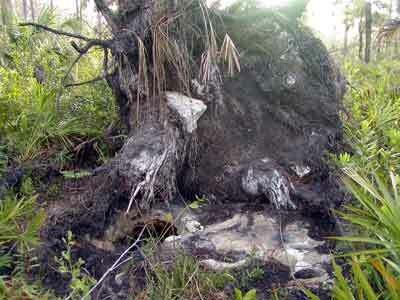 I would estimate that one out of fifty cypress trees suffered damage. Out of this damage comes the opportunity to learn something about the Big Cypress Swamp. The pine trees grow on a shallow surface of soil. Below this soil is what we refer to as cap rock. It is actually coral reef and shallow seashore that over time hardened into rock and eventually was up lifted from the sea. The organic soil over this cap rock, over time built up to varying depths from roughly one foot thick, to almost nothing in thickness. The pine trees rooted in this shallow soil. A lucky tree, was able to send a tap root down into the cap rock, giving it some strength and attachment to the ground. 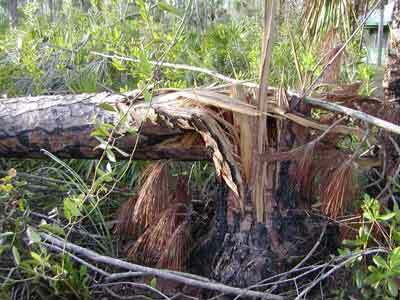 Then it was able to survive the winds of Wilma. Some trees were not that lucky. A few of those trees that had a good foot hold, still didn't survive the winds of Wilma, snapping off above ground, (as seen in first picture). 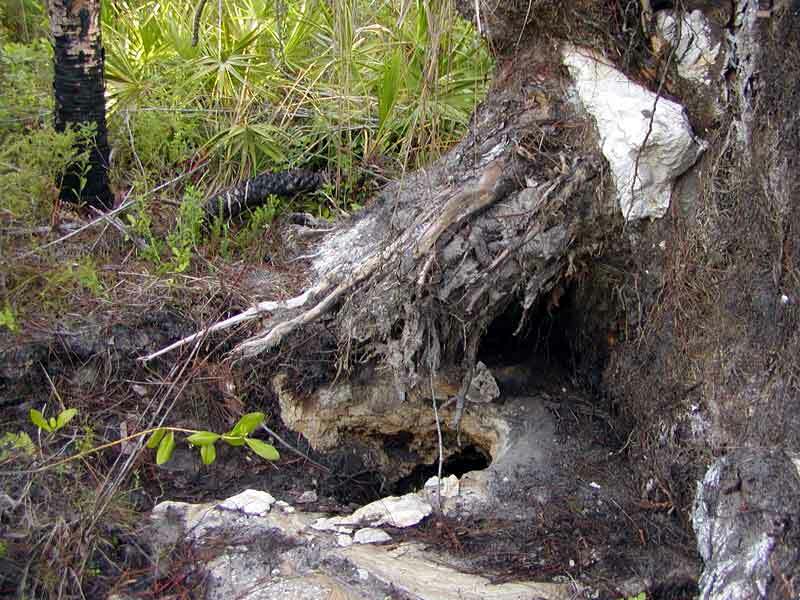 The majority of the damaged pine trees, uprooted from the soil, (as seen in the second picture. The root system of the pine tree, upon encountering the cap rock spreads out along the surface of the rock. The roots consisting of thousands of hair like threads, totally encompass the organic material above the cap rock. The roots search for every foot hold and cranny and fill every void available. Therefore when the tree is uprooted, it takes all the organic soil with it. This leaves bare rock exposed. The geology of the subsurface is there for all to see, (as shown in the third picture). 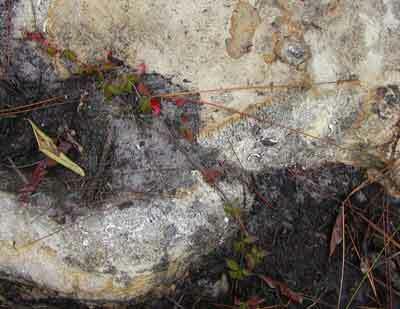 Sometimes chunks of the cap rock goes with the uprooted root ball, (as can be seen in the third and fourth picture). What does the cap rock consist of? As can be seen in the fifth and sixth picture, it can consist of hardened seashore, shells and coral (reef) rock. 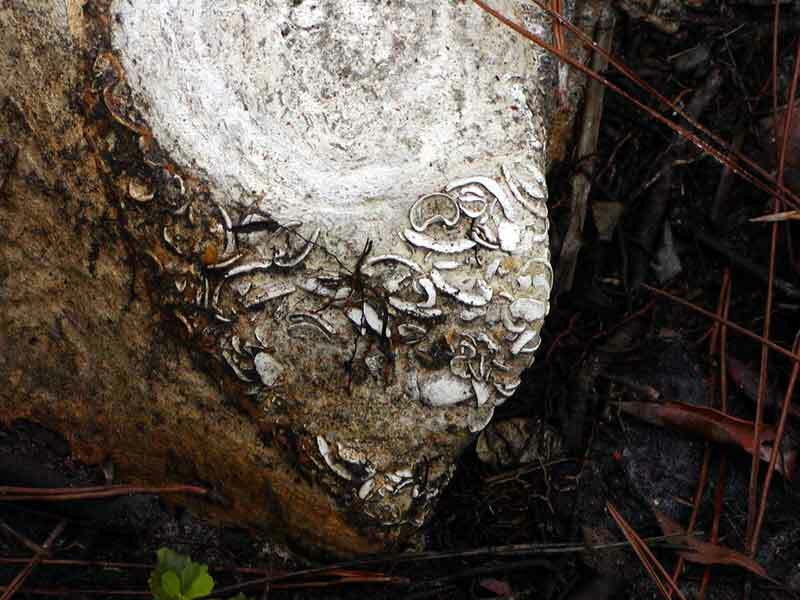 The fifth picture shows seashells compacted into hardened rock. As the sea receded and the seashore elevated above the sea, it had been compacted by the forces of nature into a rock like substance. 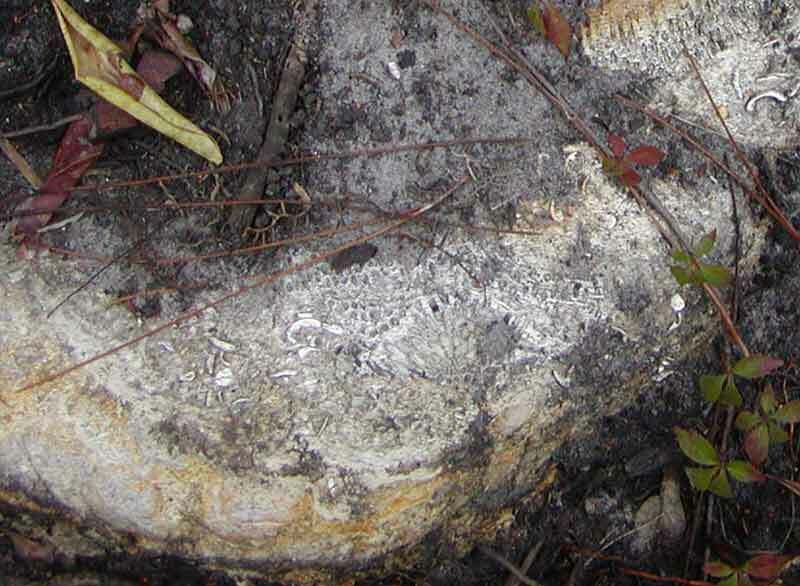 The sixth picture shows the skeletal coral reef material, intermixed with shell material. (You can click on any of the pictures and get a bigger view). (If you click on the sixth picture you will get a closer, enlarged view of the coral skeletal material). What does the future bring for the uprooted area of the ground? 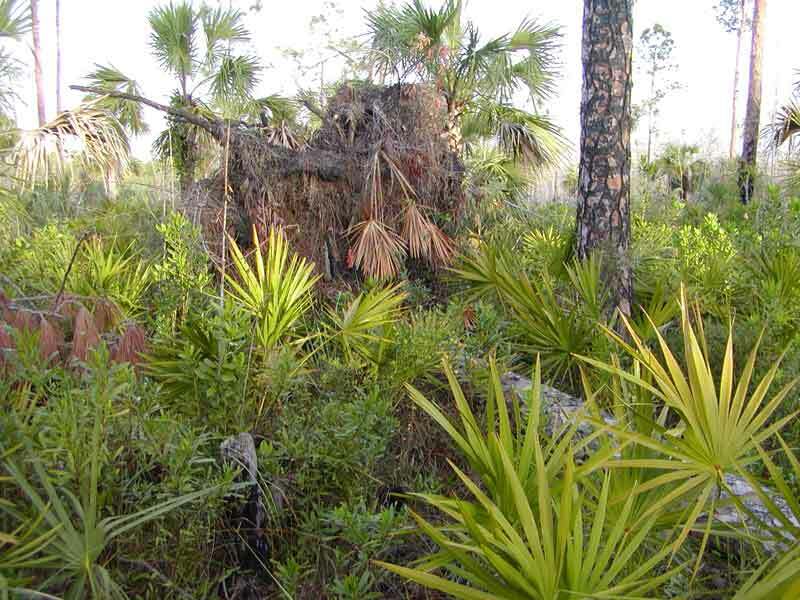 Many a Big Cypress Swamp outdoorsman will tell you of walking through palmetto and pine areas and suddenly stepping into a hole in the ground. Some will say, "I almost broke my leg, stepping in that hole". " Good thing I wasn't running". A hole in the rock, where did that come from? Well the answer is, that a fire (which is good for the ecology of the area), will come through the area of uprooted pine trees. The pine trees and root balls will entirely be consumed by the fire. So what is left, a few loose rocks sitting on the surface of the ground and bare cap rock with a big hole where the tap root used to be. Camp Six Pack has a coral rock fireplace in the sleeping building. Where did all that rock come from? It came from collecting the rock after a fire. Over turned trees broke off cap rock and the rock was left laying on the ground after the fire had passed. A lot of walking and picking up rock, but that fireplace is really nice on a cold day in the Big Cypress Swamp.